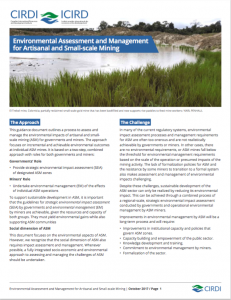 This guidance d ocument outlines a process to assess and manage the environmental impacts of artisanal and small-scale mining (ASM) for governments and miners. The approach focuses on incremental and achievable environmental outcomes at individual ASM mines. It is based on a two-step, combined approach with roles for both governments and miners.